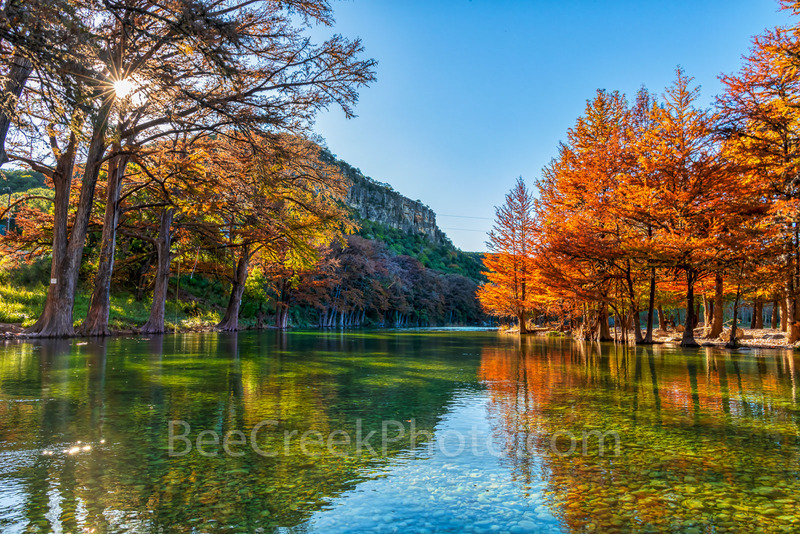 Fall in the Texas Hill Country - Texas hill country landscape canvas and prints - This is the clear waters of the Frio River as it flow downstream from Garner State Park with the cypress trees and maple trees lining the river showing their fall color on this day. The sun was just at the right level to send it rays through this cypress tree and shine down into the river and show all the river rocks. Autumn in the Texas hill country is my favorite time of the year it can be colorful as the cypress turn this rusty shade of orange to red and the maple change from yellow to orange along the blue green waters of the Frio river in this texas landscape. The water was running faster than normal after a storm the night before so I had to very carefully work my way out into the waters as they were flowing over the low water crossing just below my knees so there was little room for error. My partner remind me to keep the camera out of the waters if I go in. You can see Old Baldy in the background a favorite climbing spot for many tourist to the area. Photo © copyright by Bee Creek Photography - Tod Grubbs / Cynthia Hestand.